Roger is still getting pummelled in the middle of the rows of the Indians. When he winds up on the ground, one of them says he will remain captive. It seems if he hadn't fallen, he might not have remained a captive. Fergus reports back to a group of dudes that Murtagh has been captured. He won't let Murtagh go down. Lord John reports to Brianna that Stephen Bonnet has been retained once again and will be hanged in a week. She wants to see him. Lord John doesn't want Brianna to attend the execution, and she assures him she only wants to talk with him. He's wary about that, too, so Brianna shows him Jamie's letter. In the letter, Jamie begs Brianna to forgive instead of seeking vengeance on her attacker. She needs to say her peace in the hope she can be free of Bonnet in the future. Roger is doing tasks like carrying wood. One of the women gives to him a weed for the pain. The Mohawk believe Roger cannot be good as he was sold by his own people. The blue guy has a name, Kaheroton. The woman reminds him that peace, as well as war, begins in the minds of men. John and Brianna arrive in Wilmington. They discuss how they both miss Clare. John thinks her parents will do everything in their power to be back before the baby arrives. Roger offends Kaheroton by speaking when he speaks and pointing. The woman stands up for him. An elder comes over and directs Roger to be put into a hut. There is another man inside the hut. Father Alexander Farigault. He says Roger has been christened Dogface, which might be a compliment as the Mohawk like dogs. Marsali is pleased Fergus is going to try to free Murtagh from jail. It turns out that Father Alexander is the father of the healer's baby and only out of favor because he will not baptize the baby. He won't do it because he won't subject his child to the false promises of a fallen priest, which he is since he broke his vows by falling in love. Roger decides to dig out of the hut while Father Alexander is on his naked walkabout tour. He returns with a giantic gash in the side of his skull. Roger is shocked that Father Alexander won't just pretend to do the sacrament to save his own skin. He thinks the guy is a forking idiot. Roger finally shares his story with Father Alexander. He thinks he's a big idiot, too. Roger regrets his decisions not to go home. He has changed as a result of what he's been through. Roger suggests Father Alexander fake the sacrament and then find another priest so he can confess his sin or even find the healer and take her and the baby with them, but they should dig out together so they don't stay and die a horrible death. They both begin to dig. Father Alexander doesn't share Roger's feelings on love. He wants to stay, even if it means death. Brianna prepares for her conversation with Bonnet. She has the full support of Lord John. Oh how we love him. Unfortunately, they are visiting Bonnet at the same time Fergus is carrying out his plan to free Murtagh. 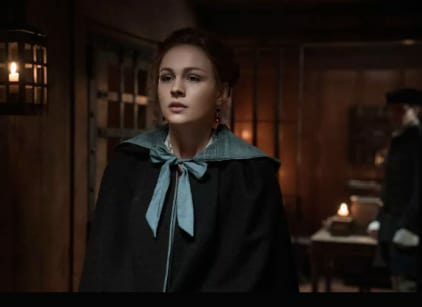 Brianna wants to see Bonnet alone, as he is in chains, so Lord John stays outside the cell in case she needs him. Brianna forgives Bonnet, and they get into a little tiff. He gives her a ruby for his child's upkeep. Bonnet almost looks human for a minute. The group frees Murtagh who then gets into an argument with Lord John. Meanwhile, the keys are inside of Bonnet's cell. That's not good. Bonnet got his foot on the keys before the jail blew. He's so outta there. Marsali absconds with Fergus and Murtagh. Roger is out of the hut. He can hear screaming. It must be Father Alexander. Lord John and Brianna are stopped by the redcoats with news about the explosion. Lord John lies to protect her friends. Roger tries to talk himself into running away from Father Alexander's screaming, but if he continues running, he will not be the character we need him to be. Roger turns and runs back to Father Alexander to find him on a funeral pyre with the tribe of Mohawk watching him burn. They turn and walk away. Roger runs toward the pyre and throws a barrel of gunpowder on the pyre. Then the healer puts down her baby and joins the man she loves on the fire. Roger is a captive once again.